In Turkey, grilled meat patties, called köfte (koeuf-TAY'), are a national favorite and the single most popular dish prepared with ground beef, one of the most common ingredients in Turkish cuisine. Köfte come in all shapes and sizes and feature different mixtures of ground beef, lamb or chicken mixed with spices, bread, and egg before they're grilled, pan-fried, stewed or broiled. In Turkish, köfte is actually a general term that refers to any food shaped by hand into a patty, ball or cylinder. Use of spices, ingredients, and cooking methods vary greatly across the country, making köfte an important example of Turkish regional cuisine. You can find some sort of köfte just about everywhere. Vendors sell them as street food, fast food chain restaurants specializing in köfte are found in every shopping mall, and even the fanciest restaurants serve gourmet adaptations of köfte. As the main course, köfte is most often served with French fries, rice, bulgur pilaf, grilled vegetables like tomatoes and peppers, and/or a green salad. If you prefer to eat your köfte like fast food, it's delicious wrapped in an unleavened flatbread called "durum" (doo-ROOM") or stuffed inside chunks of freshly-baked Turkish white bread. Stewed versions of köfte are often eaten with a spoon and some bread for dipping in the juice. The next time you plan to serve hamburgers at home, be brave and try this easy recipe for basic köfte instead. You can grill them or pan-fry them in a little bit of olive oil. Serve them up with some flatbread or pita, French fries, and salad. Put all the ingredients in a large mixing bowl. If you are using bread slices, wet them and squeeze out the water before adding them to the bowl. Briskly knead together all the ingredients for several minutes until well-blended. Set aside to rest for a few minutes. Break off an apricot-sized piece of the meat mixture and form the desired shape with your hands. Flattened meatballs or patties cook up the best. Place each patty on the grill. Grill patties, turning once, until browned on both sides. Frying: A skillet with a non-stick surface works the best. Just heat up the skillet and brown the patties on both sides. To ensure the köfte are tender, turn off the heat and cover the skillet for a few minutes before serving. Broiling: Use a broiler tray or a metal baking pan. Line up your köfte side by side leaving a little space in between each patty. Use the broiler setting on medium and cook, turning once, until your köfte is nicely browned on both sides. Many Turkish cities have köfte dishes named after them. Springy, cylinder-shaped köfte, famous all over the country, are from the Thracian city of Tekirdağ, and İzmir köftesi (iz-MEER' koeuf-TAY'-SEE'), featuring long meatballs made with fine bulgur wheat that are stewed in a tomato and sweet red pepper paste broth, come from the Aegean port city of Izmir, the former home of Homer. The Southeastern region, well-known for its spicy food, also boasts a raw version of köfte made with high-quality beef, fine bulgur and hot red pepper paste, called çiğ köfte (CHEE koeuf-TAY'). 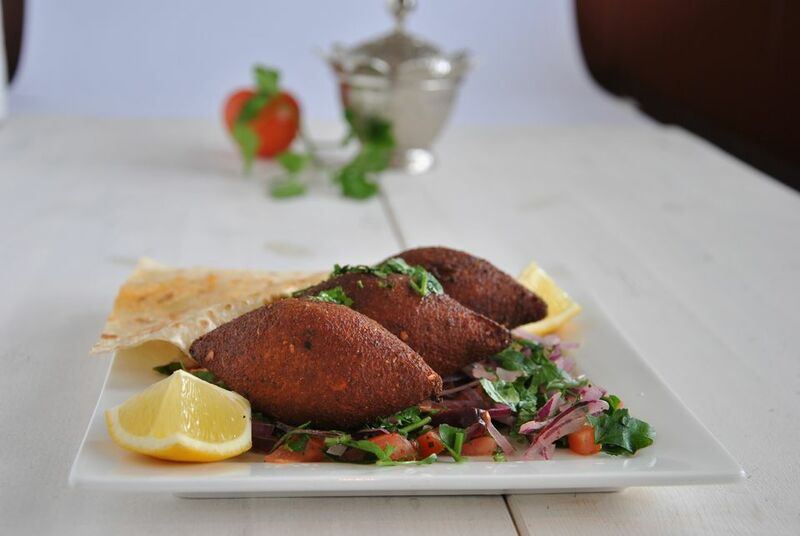 Believe it or not, vegetarians can also enjoy köfte with a meatless dish made with bulgur and lentils.